The Blue Bird Circle is a unique organization of women volunteering to support pediatric neurology. 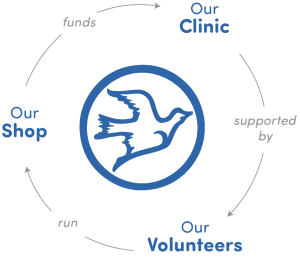 Through the revenue generated by its volunteer-run resale shop and other fundraising activities, The Blue Bird Circle donates over $1M each year to support The Blue Bird Circle Clinic for Pediatric Neurology and The Blue Bird Circle Clinical Research Center at Texas Children’s Hospital, The Blue Bird Circle Developmental Neurogenetics Laboratory and The Blue Bird Circle Rett Center. Due to our upcoming remodel, we will stop taking all clothing and furniture consignments on Thursday, May 30, 2019.